Thursday November 5th 1891 I put in a good forenoon work on Mothers dress and in the afternoon finished my waist ready to wear. I had a letter from Charlie. I wrote to him and we shipped them one feather bed. It was a splendid day. Mother went to town in the afternoon. Friday November 6th 1891 I was busy sewing on Mothers dress and got it done. She went to town in the afternoon. The boys finished husking the field here at home and began the Stevens field. Saturday November 7th 1891 It was a rainy day. I was at home all day and busy sewing all day. I was very tired went to be early. Sunday November 8th 1891 I was busy about the work all the forenoon. There was so much left undone yesterday. John & Hatt were over in the afternoon. Will went over to Woolfs a little while I read and wrote in the evening. Monday November 9th 1891 It was a pleasnt day. We washed and ironed both and I got the clothes all mended and put away before supper. I fiinished some work in the evening. I had left from last week. The boys are husking corn. Tuesday November 10th 1891 I cut three shirts for Father and two night gowns for Mother and sewed on them all my spare time till bed time. Mother went to town in the afternoon. Wednesday November 11th 1891 I sewed all the forenoon. I wrote to Charlie after dinner and got ready to go to town. It was a cold windy day. The girls were over in the afternoon. Will took me over town I left a cake I had baked at the church and done a lot of shopping. I sewed all the evening. 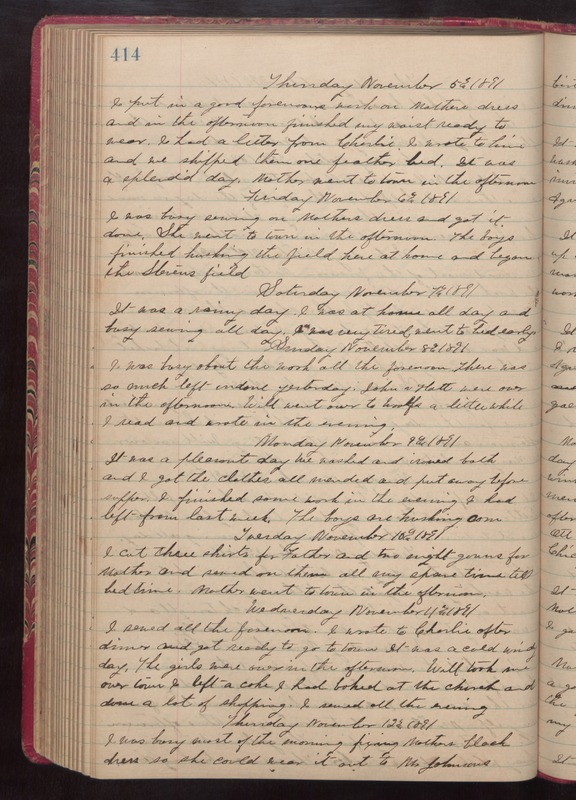 Thursday November 12th 1891 I was busy most of the morning fixing Mothers black dress so she could wear it out to Mr Johnsons.